Contained in this section are pictures of the exhibits, artifacts and photos that are at the Hose Co. No. 3 - Fire Museum. There are hundreds more that couldn't be included, giving you an incentive to visit the museum if you're in these neck of the woods. Our crown jewel is the 1882 Orman Hose Cart from the South Pueblo Volunteer Fire Department. The above photo was taken in the late 1940's when the hose cart was rescued from a local lumber yard and restored. Standing next to it is Chief Harry E. Whitcomb, who was the chief from 1949 until 1952. The photo below is a side view taken at the museum in 1990. To go along with our crown jewel hose cart, we have several items from the 1880's and the Orman Hose Co. No. 1. We have the original log book, championship belt from the Colorado Volunteer Firemen's Association Games, which the Orman Hose Co. won with the very same hose cart above. We have just recently aquired a ribbon from when the Orman's won the belt, dating from 1883. The ribbon of the J. B. Orman Hose Co No. 1 in 1883. The above belt also has engraved in it the past winners. The belt was passed from year to year, and is on display at the museum. Above left is a page from the Orman Hose Co. Log Book that dates from 1881 until 1889. Above right is a presentation trumpet to the Orman Hose Co. from 1884.
. Above is one of the original hydrants by the Birdsall Holly Company that built the first water works in the town of Pueblo in 1874. This was also the birth of the hose companies for the Pueblo Volunteer Fire Department. There were 48 hydrants installed initially and were painted dark blue with bronze striping. Our antique Gamewell Telegraph Fire Alarm System Base Station circa 1883. This is the base station for the Gamewell alarm system in Pueblo. The unit has beveled glass all the way around, and weights in the wooden base. The system was in use by August of 1883, and alarm pull boxes were placed around the town of Pueblo. The system worked by pulling the box switch, which would send a telegraph signal to this base station of the box number. The person on duty at the Water Works (where the alarm system base station was first located) would hear a bell when an alarm would be turned in, and check the base station for the box number. He would the blow a whistle with the box number (for box 23, he would blow two blasts and a pause, then three blasts and a long pause, and would repeat it 5 times.) The fire department would then go to the alarm box to find the fire. During the devastating 1921 flood of the Arkansas River in Pueblo, the base station was washed away in the flood. It was found 15 miles downriver (east) of Pueblo, and restored by Pueblo firemen. Pueblo used the Gamewell Fire Alarm system until the early 1980's. The small plaque at the base of the Gamewell base station. Gamewell Fire Alarm Box circa 1950. 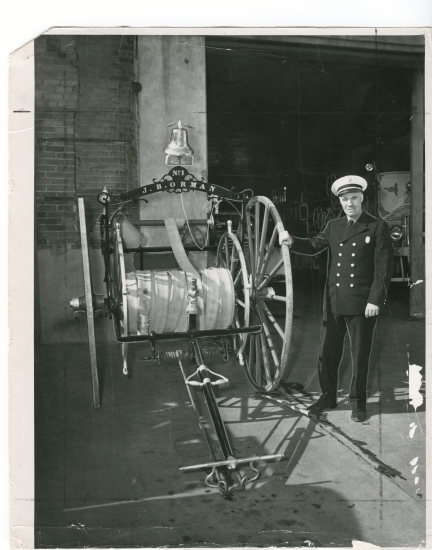 The fire department was originally started as a hook and ladder company in January of 1873 with a used hook and ladder hand pulled cart, purchased from the Denver Volunteer Fire Dept. for a sum of $600. They named the company the Pueblo Hook & Ladder Co. No. 1. The foreman of the company was G. Q. Richmond, a local lawyer, politician, and a delegate in Washington D. C. for Colorado's statehood induction ceremoney in 1876. The name of the company was changed in 1878 to the G. Q. Richmond Hook & Ladder Co. No. 1 in 1878, and would remain so until Pueblo went to a paid department in 1889. Below are the artifacts we have for the Richmond H & L Co. 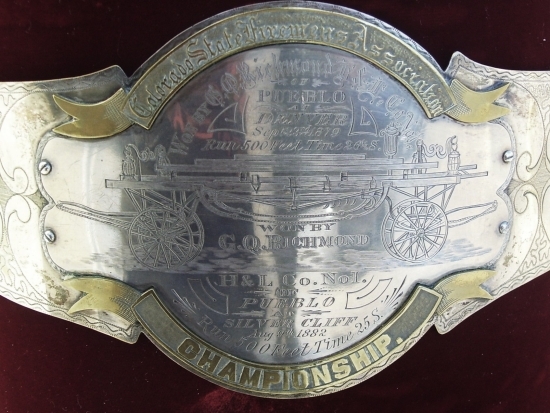 This is the Championship Belt won by the Richmond Hook & Ladder Co. No. 1 several times. You can see the engraving of two victories achieved by the company in 1879 and 1882. Below are two ribbons that were given to the company in the 1880's. The above ribbons are for the Richmond Hooks in 1884 (the top blue one) and 1882 (the bottom red one.) These items are on display at the Hose Co. No. 3 - Fire Museum. 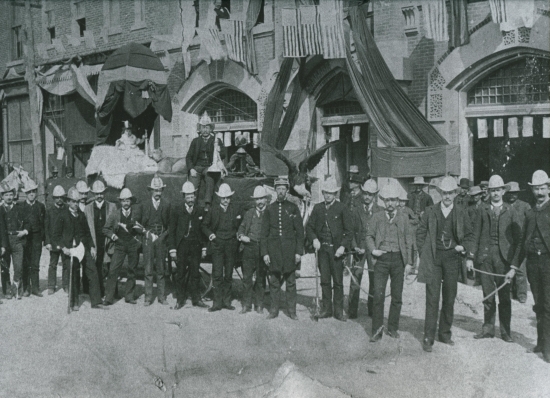 Below is a picture of the Richmond Hook & Ladder Co. ready for the Mardi Gras parade that was held on February 26, 1889. They are standing in front of the old City Hall at 616 N. Main St., built in 1882. The parade ran up Main St., and the building was decked out for the parade in buntings and flags. Note the young girl in the white dress under the canopy. That is Lilla Baldwin, young daughter of H & L member A. B. Baldwin. Now note the mountain lion sitting directly in front of her. This was a live mountain lion, a pet of H & L member Tommy Zeiger. Zeiger was the ladderman on the championship Richmond teams that won the belt and the ribbons. Under the drapings was the hand pulled hook and ladder truck purchased new in 1886. Above is the James Rice Hose belt that we have. It was made by Cairnes & Bros. Co, famous makers of fire helmets to this day. The James Rice Hose Co. No. 1 was the first hose company of the Pueblo Fire Dept. in 1874. We also have several more presentation trumpets from the 1880's and an actual fireground speaking trumpet that was used by the department back then. Below left is the trumpet given to the James Rice Hose Co. No. 1 from James Rice (former Mayor and cigar store owner) in 1874. Above right is a coffee urn with the engraving "Won By CORKISH HOSE No. 6 - Catholic Fair - Jan. 25, 1883." The cup is engraved with a number "6" on it, as is the pan under the swiveling urn. Below is a picture of the Corkish Hose Co. in front of their hose house in the 400 block of W. 4th Street. Above is a presentation gavel given to the mayor of Pueblo by the fire chief and the marshal of the police dept. Inscribed on it is: "Presented to Mayor W. B. Hamilton by Pueblo Police Dept. J. T. Connor, Marshal Pueblo Fire Dept. R. J. Krague, Fire Chief." The above ads are from the late 1920's from Fire Engineering Magazine The American City Magazine. The above right photo shows the "Chiefs Office", as do the ones below. Termed a "Life Saving Machine" this canvas net would be held by firefighters to rescue people trapped on upper floors. Part of our collection of fire extinguishers above left. At right is a wall of pictures, plaques, and advertisements for the Pueblo Fire Dept. Our fire patch collection has been growing. We now have over 750 patches on the wall. We are always interested in trading patches. We have hundreds of pictures, plaques, awards, and ads that feature the P. F. D.
Above left is a 36" wooden water pipe, taken from Prairie Ave, by the fairgrounds. Thanks to John Norton and the Pueblo Board of Water Works for making the stand and varnishing the pipe, as well as donating the pipe itself. Above right is a book about the San Francisco earthquake and fire (and the Mt. Vesuvius eruption), published in 1906. Book courtesy of the Jack Maloney family. Above is a set of 3 Fire Prevention and Insurance books, published in 1912, courtesy of the Jack Maloney family. They have a tremendous amount of information of the era. Above left is a Prestone Antifreeze ad from 1947. Above right are two different sprinkler shut-off devices from the 1940's or early 1950's. Above left is an original ad for a pump for the Christy pumper. Above right is a picture of the original Pueblo Fire Dept. t-shirts from the 1980's. Above left are 2 American LaFrance fire extinguishers. Above right are Asst. Chief John Emory's helmet and t-shirt. 3 "Emergency" television show comic books from 1972.